Rules are made to be broken—your inner teenager already knows this. But it applies to being an adult, too: Breaking a rule or two is the first step to setting yourself free from convention so that you end up with a home you actually like. A home that’s unique, that feels like you. “Ignore ALL THE RULES!” says HGTV decorating star Leanne Ford. “Do what you want—it’s your place! Get wild!” You don’t have to be a decorator to know what the decorating rules are, either; oftentimes they’re so ingrained that we don’t even realize we’re toeing the line. Take bed frames and box springs, for example. You don’t need them! A mattress can go right on the floor and look very chic while it’s at it. Maybe DIY a headboard to go behind it or, you know what, don’t. Headboards don’t really do anything; they are not requirements. Ceilings don’t have to be white, kitchens don’t have to have upper cabinets. Somebody’s been lying to you, and we’re here to rectify it. Here are ten decorating “rules” that are actually absolute bunk. Get out there and ruffle some feathers. 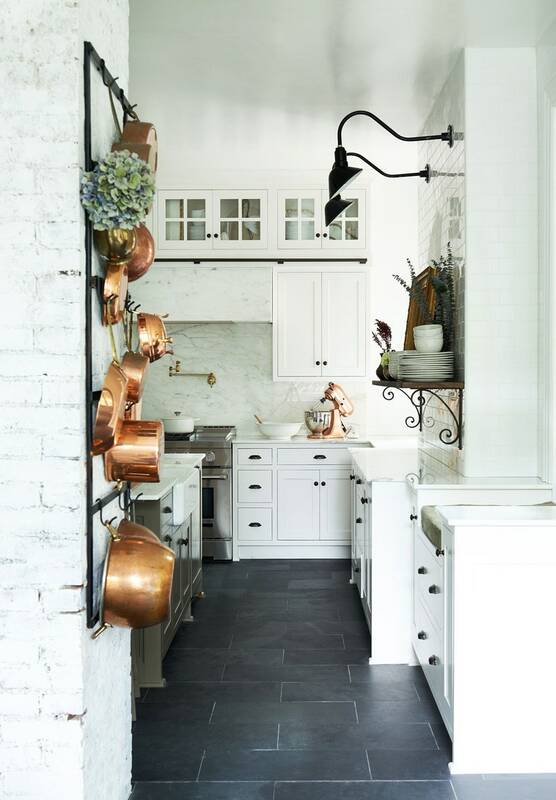 Copper plays nice with darker metals in a kitchen by Leanne Ford. “The idea that white furniture with kids or pets can’t work seems to be outdated,” says Keren Richter of White Arrow, designers of this extremely inspiring schoolhouse loft. “There are sophisticated Crypton and Sunbrella fabrics out there that resist staining, sun damage, and can even be bleached.” Shop and upholster wisely and you can have the mega Zen, all-white living room of your dreams without freaking out if people sit on the couch holding a glass of red wine. We’ve said it before, but your mattress really doesn’t have to go in a bed frame—just set it right on the floor and save yourself the extra cash. What, you want proof? Just take a look at the Studiomama’s sub-400-square-foot London homethat’s entirely without bed frames and yet doesn’t look an inch amiss. But why? How boring. “In the bathroom, we prefer to find bathroom accessories that don’t match the finish of the plumbing fixtures,” say Jess Thomas and Andrea Fisk of Shapeless Studio. “For example, the toilet paper holder and towel hooks could be brass, while the plumbing finish is brushed nickel. We often mix and match finishes to make a bathroom feel a bit spontaneous. It helps to add a little bit of character.” Designer Leanne Ford agrees, naming “don’t mix metals” as one of many rules she loves to break. Honestly, the rug should be whatever size looks right to you. Some say that a small rug will make a room look smaller, but that’s really not a problem in the living room of Lisbeth Beck’s Denmark apartment, which has beautiful wood floors she didn’t want to cover up. Sure, there’s something to be said about easily seeing the painting you’re hanging specifically so you can look at it all the time. But in some of our favorite homes, like Spencer Luckey’s rambling Connecticut house, art is everywhere—up high near the ceiling, down low by the floor, more a blanket of art rather than some orderly gallery display.